1798. Gasometer at Boulton and Watt. 1805. 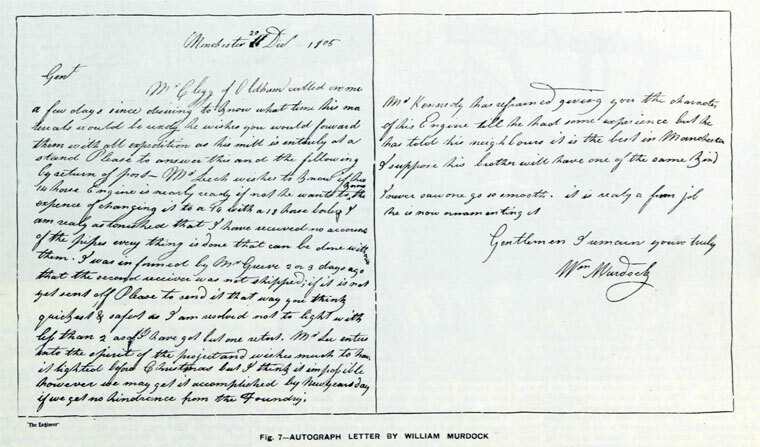 Autograph letter by William Murdoch. 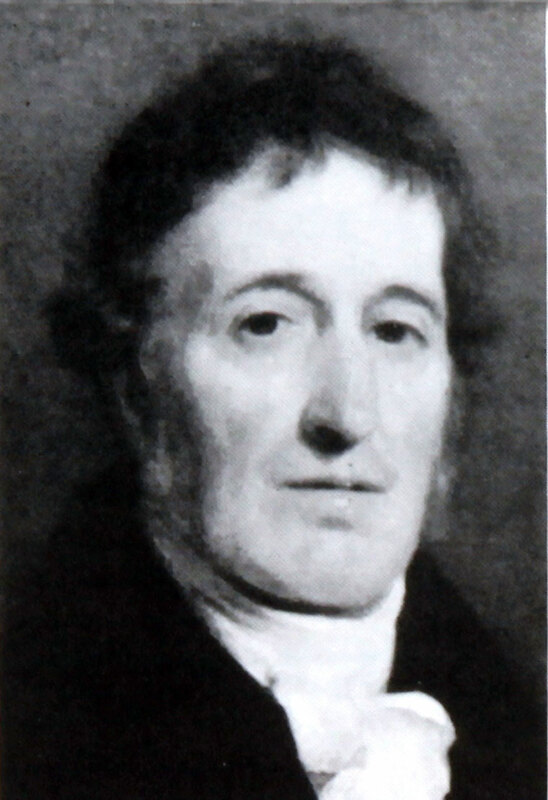 William Murdoch (1754-1839) (sometimes spelled Murdock) was a Scottish engineer and inventor. It has been argued that William spelled his name Murdock rather than Murdoch, and a letter which he wrote in 1805 does show a distinct difference between the last letter of his name and the last letter of 'Leech'. He was employed by the firm of Boulton and Watt and worked for them in Cornwall as a steam engine erector for ten years, spending most of the rest of his life in Birmingham. He was the inventor of gas lighting in the early 1790s and coined the term gasometer. 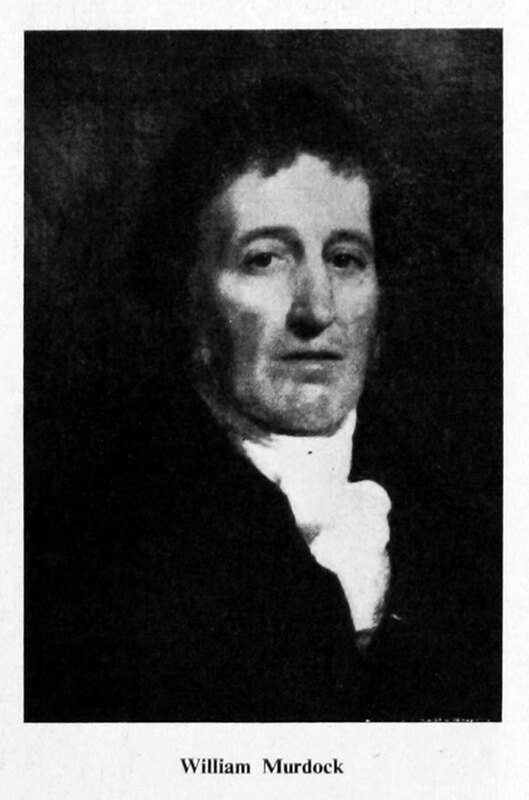 In addition to gas he made a number of innovations to the steam engine, including the sun and planet gear and D slide valve, invented the steam gun and pneumatic tube message system, worked on one of the first British paddle steamers to cross the English Channel, built a prototype steam locomotive in 1784 and made a number of discoveries in the field of chemistry. 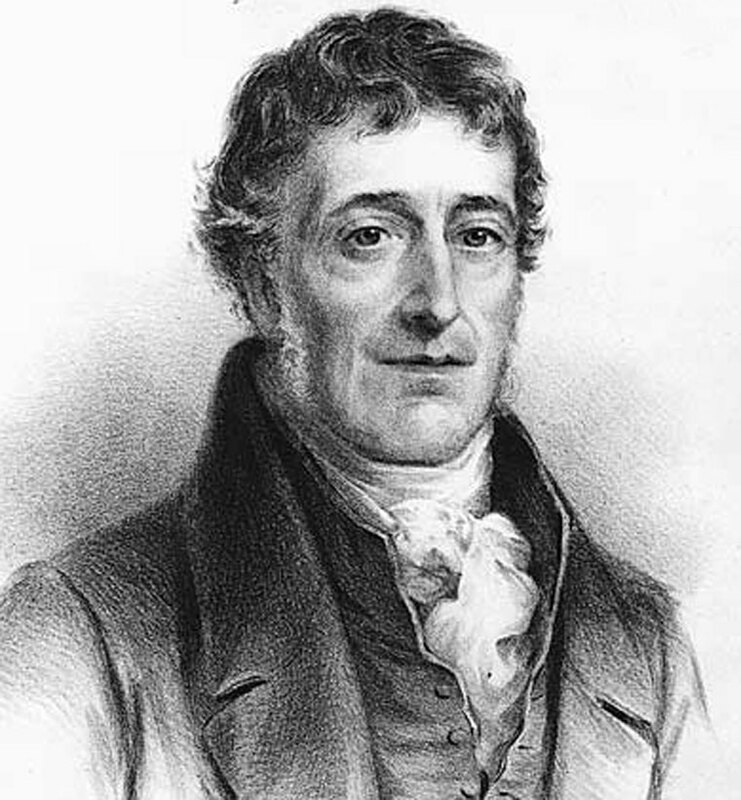 He remained an employee and later a partner of Boulton and Watt until the 1830s and his reputation as an independent inventor has tended to be obscured by the reputations of those two men and the firm they founded. 1754 August 21st. William Murdoch was born near Cumnock, East Ayrshire, Scotland, the third of seven children and the first son to survive beyond infancy. 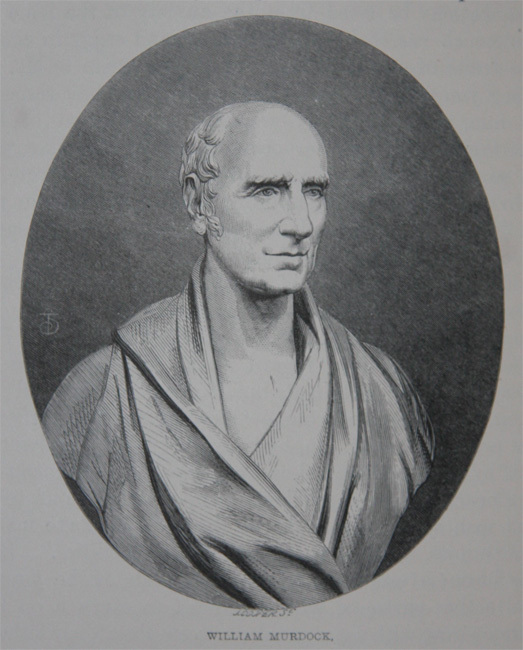 The son of John Murdoch, a former Hanoverian artillery gunner and a Millwright and tenant of Bello Mill on the estate of James Boswell in Auchinleck, he was educated until the age of ten at the Old Cumnock Kirk School before attending Auchinleck school under William Halbert, author of a highly regarded arithmetic textbook. There he excelled in mathematics. In addition to formal education he learned the principles of mechanics, practical experimentation and the working of metal and wood from watching and assisting his father's work. Together with his father, he built a "wooden horse" about 1763. Murdoch's "Wooden Horse on Wheels" was a tricycle that was propelled by hand cranks. 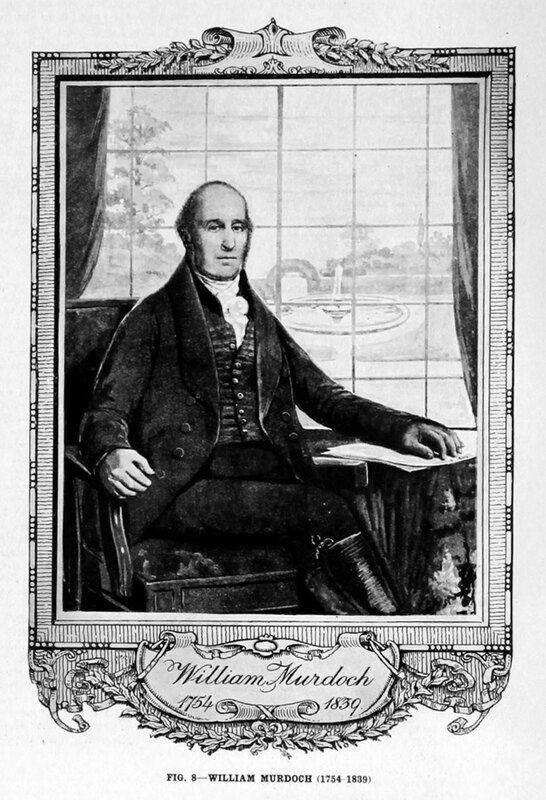 There are also numerous reports that in his youth William was responsible for the construction of one of the 30 bridges over the River Nith, although it is possible that this derives from his fathers work in building the Craikston Bridge over Lugar Water in 1774, which William would certainly have been involved in. Tales also abound of William carrying out early experiments into natural gas using coal heated in a copper kettle in a small cave 70 feet from his father's mill. There is however no contemporary documentation for these claims. 1777 At the age of 23, he walked to Birmingham, a distance of over 300 miles, in order to ask for a job with James Watt, the famous steam engine manufacturer. It is likely that both Watt and Murdoch were already aware of each other due to their connections with James Boswell who had made several visits to Watt's workshop at Soho. Watt's partner Matthew Boulton was so impressed by a wooden hat, made by Murdoch on a lathe of his own design, that he gave him a job. Watt began his career with Boulton and Watt in the pattern shop of their Soho Foundry making patterns for the casting of machine parts. 1778 He progressed quickly and by 1778 Watt had written: if William Murdoch is not at home he should be sent for immediately as he understands the patterns and care must be taken to avoid mistakes of which our engine shop has been too guilty. Murdoch soon progressed to work in fitting and erecting steam engines and was often dispatched away from Soho for this work. 1779 Boulton was writing to Watt: I think Wm. Murdock a valuable man and deserves every civility and encouragement. On his first solo job erecting an engine at Wanlockhead Mine Murdoch made the first of many improvements to the standard Boulton and Watt engine by rearranging the gears to enable the steam valve to be automatically worked by the action of the exhaust shaft'. Murdoch also became a member of the Lunar Society, a regular gathering of influential scientists and industrialists from around Birmingham. 1779 In September Murdoch was sent to Redruth in Cornwall as a senior engine erector, responsible for the erection, maintenance and repair of Boulton and Watt engines. These were used for pumping water out of the Cornish Tin mines, and therefore the efficiency and efficacy of the engines was an important factor in the amount of tin, and money, which could be extracted from a mine. At that time steam engines were not simply sold to customers but operated, and maintained by the builders for groups or individuals known as 'adventurers' (shareholders). The engine manufacturers were paid not for a completed engine but through a complex formula calculated on the basis of that engines performance, as Watt described: Our profits arise not from making the engine, but from a certain proportion of the savings in fuel which we make over any common engine, that raises the same quantity of water to the same height. Therefore Murdoch's skill in getting the most out of his engines directly impacted upon Boulton and Watts profits. This he did so successfully that by 1782 Boulton was writing: We want more Murdocks, for of all others he is the most active man and best engine erector I ever saw...When I look at the work done it astonishes me & is entirely owing to the spirit and activity of Murdoch who hath not gone to bed 3 of the nights. Due to the frequent problems which could occur with steam engines Murdoch was kept busy travelling around the area repairing and attempting to improve the performance of the engines under his care. In Cornwall at that time there were a number of engine erectors competing with each other, each with different technical methods of achieving the same ends. As such a great deal of copying of mechanical innovations, and violation of patents went on, often through the reporting of casual conversations between engineers and practical observations of engine modifications. The risk of his patents being infringed upon was something which particularly exercised Watt and so Murdoch was, in addition to his other activities, called upon to make reports and swear out affidavits for legal actions against Boulton and Watt's competitors. In the close knit and clannish Cornwall of the time this was sometimes at his own risk. As one of his colleagues stated to Watt: If he makes an Affidavit against Carpenter or Penandrea, there will be no safety for him in Redruth. 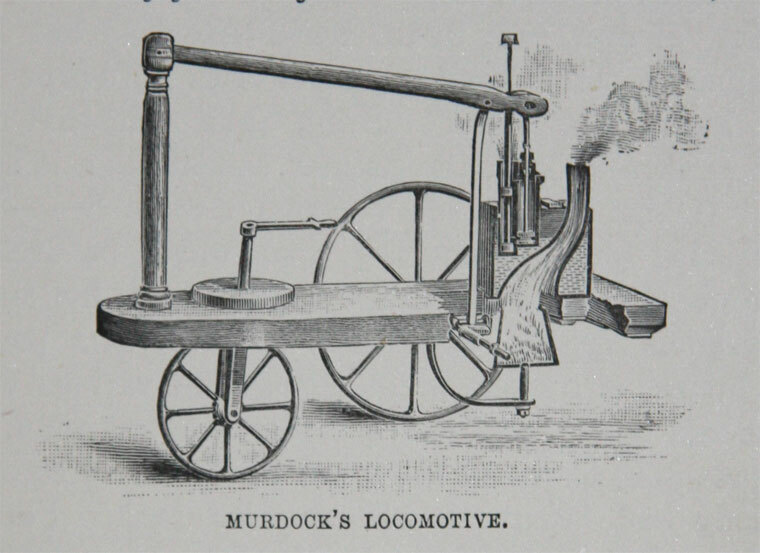 This early industrial espionage did not operate all in one direction and Murdoch was often required to undertake inspections of competitors engines, either to determine whether patents had been infringed or to assess the effectiveness of those engines. 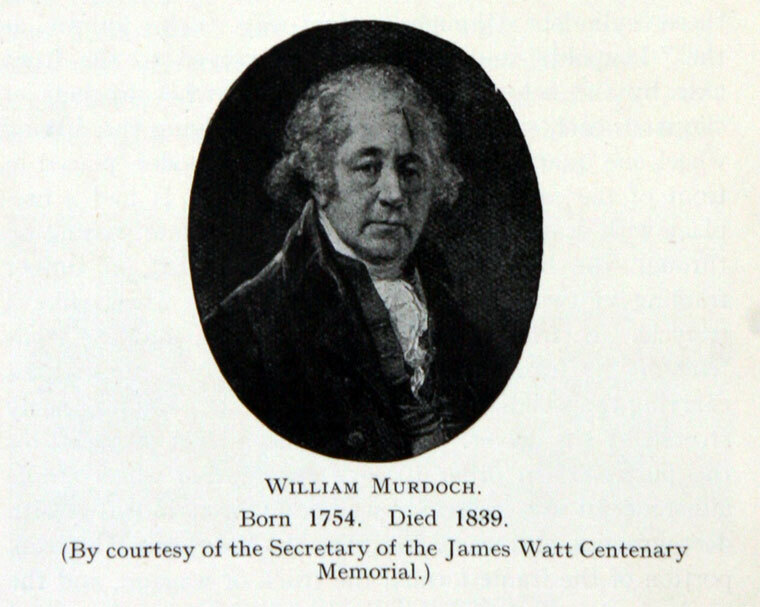 From 1782 there is evidence that Murdoch was discussing and collaborating with Watt on a number of inventions and improvements. There is however a dearth of letters from Murdoch to Watt from 1780 until 1797 in the Watt archive, possibly, as argued by John Griffiths, due to an attempt by Watt's son, James Watt (Junior), to uphold his father's reputation by removing any evidence of the origin of some of the inventions he patented. It is almost certain that Murdoch's contract of employment, in common with those for other employees of Boulton and Watt, specified that anything he invented would be the intellectual property of his employers, and frequently it was they who filed, and benefited from, patents on these inventions. One of Murdoch's most significant inventions, for which evidence exists to attribute it to him, was the sun and planet gear which allowed steam power to be used to "produce a continued Rotative or Circular Motion round an Axis or Centre, and thereby to give Motion to the Wheels of Mills or other Machines". This gear converted the vertical motion of a beam, driven by a small steam engine, into circular motion using a 'planet', a cogwheel fixed at the end of the pumping rod (connected to the beam) of the engine. With the motion of the beam this revolved around, and turned, the 'sun' a larger rotating cog which turned the drive shaft. This system of achieving rotary motion was patented in his own name by James Watt in October 1781 although Samuel Smiles, biographer of Boulton and Watt, attributes this to Murdoch and there also exists a drawing of the sun and planet system in Murdoch's hand dated August 1781. Other evidence attributing this invention to William Murdoch takes the form of a letter from Boulton to a colleague concerning Watt's forthcoming October patents in which he writes: He has another rotative scheme to add, which I could have told him of long ago when first invented by William Murdock but I do not think it a matter of much consequence. 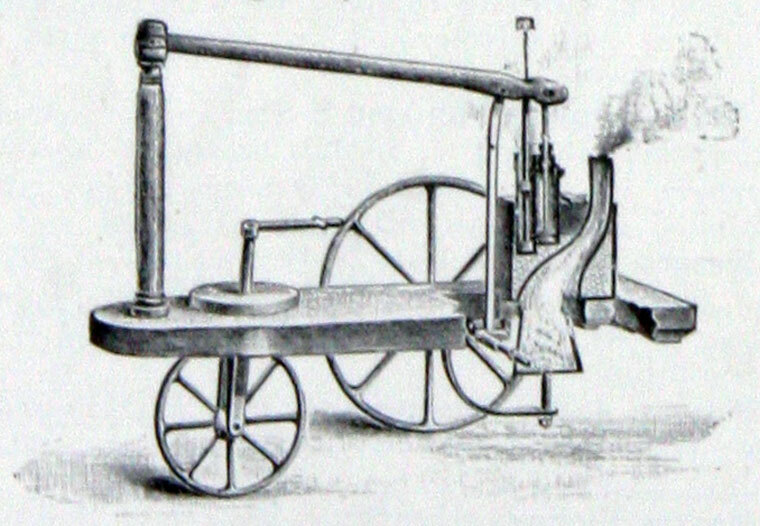 1799 Another innovation of Murdoch's was his invention of a much simplified and more efficient steam wheel than those in use at the time. A precursor of the steam turbine the steam wheel allowed the wheel to be directly turned by the pressure of the steam moving through it. By this time Murdoch's contract had been amended and he was able to patent this device in his own name. Murdoch also carried out a number of experiments with compressed air and developed the first pneumatic message system which worked by using compressed air to propel a message in a cylinder through a tube to its intended destination. This system was developed by the London Pneumatic Dispatch Company and became widely used, Harrods in particular used this system until the 1940s. Murdoch also used compressed air to ring a bell at his home to announce visitors. 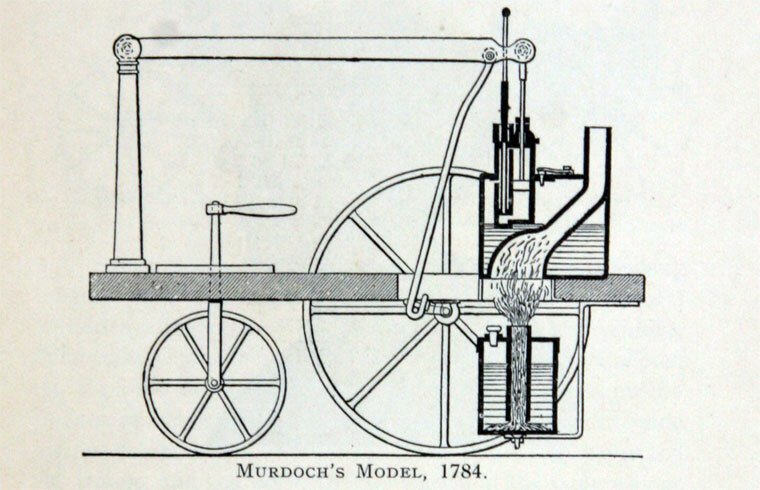 Some of Murdoch's other minor inventions and experiments were; a machine developed in 1784 or 1785 in Cornwall for drilling wooden pipes, in 1810 this was further developed and patented for stone pipes, a steam cannon which he attempted to use in 1803 to knock down a wall at Soho, a steam gun in the same year which fired 3 cm lead bullets; and machinery to grind and compress peat moss under great pressure to produce a material with "the appearance of the finest Jet". In addition to his mechanical work Murdoch also experimented in the field of chemistry and made a number of discoveries. One such was the discovery, first recorded in 1784, of iron cement made from sal ammoniac, or ammonium chloride and iron filings, apparently discovered when Murdoch observed that these 2 components had accidentally mixed in his tool bag and formed a solid mass. This iron cement was used to fix and harden the joints of steam engines, thus creating a hard durable seal. Another discovery, and the first for which Murdoch took out a patent was that of the art or method of making from the same materials and by the same processes entirely new copperas, vitriol, and different sorts of dye or dying stuff, paints and colours, and also a composition for preserving the bottoms of all kinds of vessels and all wood required to be immersed in water, from worms, weeds, barnacles, and every other foulness which usually does or may adhere thereto. This patent was filed in 1791 and although it was not developed at the time this can be seen as the first step in the development of aniline dyes and coatings. In 1795 Murdoch developed a replacement for isinglass, a precipitate made from sturgeon used in the clarifying of beer to remove impurities, which had to be imported from Russia at great expense. Murdoch's replacement was made from dried Cod and was much cheaper than the 25 shillings a pound which isinglass cost. This cost saving was so attractive that the Committee of London Brewers paid £2000 for the right to use his invention. Murdoch's isinglass replacement was so effective that in a court case brought by the British Customs and Excise Authorities, the noted Chemist, Sir Humphry Davy in answer to a question on whether it was "proper to be used for the purpose of fineing beer" testified that: I believe it is if properly prepared - it is the same substance as Isinglass. Use of Murdoch's "Isinglass made of British fish" continued and played an important role in reducing British brewers reliance on imported raw materials. 1792 The key invention for which Murdoch is best known is the application of gas lighting as a replacement for oil and tallow produced light. It was in 1792 that he first began experimenting with the use of gas, derived from the combustion of coal and other materials, for lighting. There is some uncertainty as to when he first demonstrated this process in practice, however most sources identify this as between 1792 and 1794. In order to use gas for practical purposes it was first necessary to develop a working method for the production and capture of the gas. There is considerable doubt as to the date by which this process was perfected. However, numerous accounts exist that by 1794 Murdoch was producing coal gas from a small retort containing burning coals with a three or four foot iron tube attached, through which he piped the gas before sending it through an old gun barrel and igniting it to produce light. It is frequently claimed that Murdoch's house at Redruth - or his cottage at Soho - was the first domestic residence to be lit by gas. While this claim can be more believably applied to his cottage in Redruth than to Soho most witnesses to his private demonstrations of gas lighting agree that his gas production and lighting apparatus was in fact set up in his workshop or foundry in his yard, rather than the house itself and that there was no permanent gas lighting in place in his home. In view of the smell, risk of poisoning and chance of accidental combustion of this experimental method of lighting it is no surprise that it was not, even by its inventor, used as widely or as casually as is today often claimed. 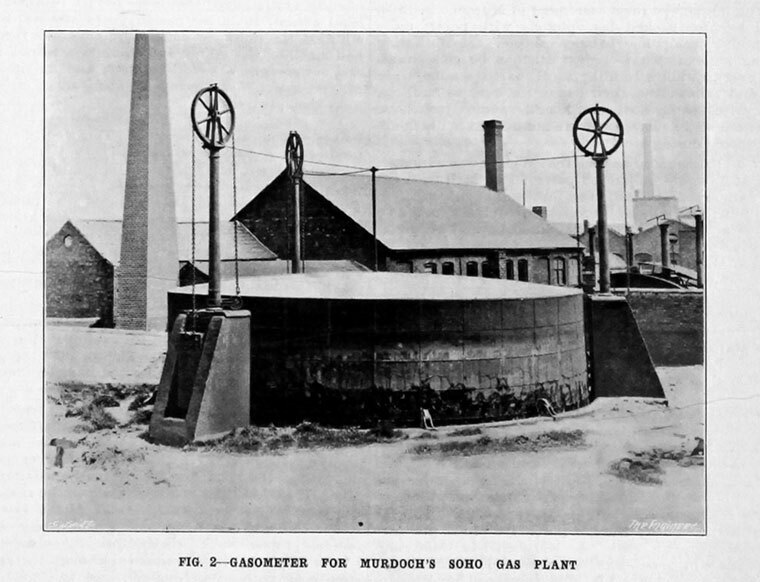 Over the next few years Murdoch performed "a series of experiments upon the quantity and quality of the gasses contained in different substances" and upon the best way of transporting, storing, purifying and lighting these. It is known, by the account of William Fairbairn that Murdoch occasionally used his gas as a portable lantern. It was a dark winter's night and how to reach the house over such bed roads was a question not easily solved. Mr Murdoch, however, fruitful in resource, went to the gasworks where he filled a bladder which he had with him, and, placing it under his arm like a bagpipe, he discharged through the stem of an old tobacco pipe a stream of gas which enabled us to walk in safety to Medlock Bank. 1798 Murdoch returned to Birmingham to work in the Soho foundry and continued his experiments with gas, as part of which he lit the interior of the Soho main building, although it is likely that it was lit only in part and not (at this time) permanently. In 1802 as part of the public celebrations of the Peace of Amiens he made a public exhibition of his lighting by illuminating the exterior of the Soho Foundry. The first industrial factory to be illuminated by gas was the Philips and Lee of Salford cotton mills in Manchester which was fully lit by Murdoch in 1805, four years after the idea was first broached. Initially this mill contained 50 gas lights, although this soon grew to 904. The length of time taken to complete this project was partly due to experimentation and improvements in the process developed by Murdoch to make the lighting of a large factory by gas practicable & cost effective - such as purifying the gas with lime to remove the smell and determining the best temperature to heat coal to obtain the maximum quantity of gas - although Murdoch continued to be involved in other engine work for Boulton and Watt, which took up much of his time. Despite his pioneering work with gas Murdoch never made any money from this invention due to his failure to obtain a patent; which may have been partly a result of the advice of James Watt (Junior), that the discovery was not patentable; and partly due to the commercial failure of his earlier patent of 1791 for an early form of aniline dye. This failure to apply for a patent, despite the commercial participation of Boulton and Watt in this field, left the fledgling industry of gas production and lighting open for exploitation by other commercial interests, such as his former assistant Samuel Clegg and Friedrich Winzer. In large part this was due to the failure of Boulton and Watt to make sufficient effort to expand from the factory and mill lighting market which they dominated by 1809 into the street and domestic lighting market. This reason for this lassitude is unknown but can be attribute to lack of interest, a misappreciation of the size of the potential market and a lack of desire to be involved in smaller less prestigious projects. By May 1809 Boulton and Watt faced little competition in any gas market due to their success in lobbying Parliament to block the granting of a charter for the National Heat and Light Company, their only real competitor in this field. However, despite blocking the charter until 1812 this advantage was squandered as Boulton and Watt did not develop the gas market, or technology, and in 1814 abandoned the gas business. A few decades later most towns in Britain were lit by gas and most had their own gasworks. Apart from the benefits of gas lighting and heating the production process of coal gas yielded a number of other substances which were subsequently successfully exploited. Such as coke; ammonia; phenol (carbolic acid), a disinfectant and one of the components of Bakelite the first synthetic plastic invented in 1910; and coal tar which contained a number of organic chemicals. Coal tar was subsequently used to produce the first synthetic dye, mauve, by William Perkin in 1856 and in 1853 was found, by Charles Gerhardt to contain the chemical acetylsalicylic acid, now known as aspirin. Boulton and Watt had been involved in a minor way with attempts to apply steam power to boats, providing in 1807 for Robert Fulton the engine for PS Clermont, the first steamboat to run on the Hudson river. Murdoch was primarily responsible for designing and building this engine and for agreeing technical details and designs with Fulton, who also worked on the design of the engine. Boulton and Watt also provided engines for a number of other marine vessels. However, it wasn't until the purchase of the PS Caledonia by James Watt Jr. in 1817 that they became seriously involved in the marine engineering business. The task of refitting The Caledonia, building and installing new engines and boilers and making her seaworthy and efficient in fuel consumption was a difficult process and Murdoch, although frequently suffering from fever and Rheumatism, directed this. By August the vessel was able to be tested on its intended route, from Surrey Commercial Docks, London to Gravesend and at first made 8 miles per hour. During its sea trials Murdoch carried out experiments on The Caledonia to measure the effect on fuel consumption and speed on changes in the depth of the paddles and whether one or both engines was used. This resulted in an increase of speed to 12 mph. While carrying out trials The Caledonia was challenged to a race by their competitors for the London to Gravesend route, the Sons of Commerce. Actually there were 2 races to Gravesend, both of which were won by the Boulton and Watt vessel, by a greater margin on the second attempt. The result was that the proprietors of the Sons of Commerce placed an order with Boulton and Watt for a new steamboat engine. There were also a number of other orders for steamboat engines, both for commercial customers and the Royal Navy and Murdoch was in effect the head of this branch of the business, being referred to and deferred to on all aspects of their marine business. It is estimated that from 1813 until 1825 over 3,000 horsepower of marine engines were made by Boulton and Watt, around 40 to 60 vessels. Shortly after the trials were completed The Caledonia carried out a crossing of the English Channel when Watt Jr. took it to Rotterdam and up the Rhine to Koblenz. 1808 Murdoch wrote a paper, "Account of the Application of Gas from Coal to Economical Purposes" which was presented to the Royal Society. In that year he was awarded their Rumford Gold Medal for "both the first idea of applying, and the first actual application of gas to economical purposes". 1815 He designed and installed the first gravity fed piped hot water system since classical times at Leamington Spa Baths. 1815 While engaged in erecting apparatus at Leamington a cast-iron plate fell on his leg and severely injured him. He remained a long time in Leamington. 1817 Murdoch moved into a large new house he had built outside Birmingham. The house incorporated a number of curiosities and innovations he has designed including gas lighting, a doorbell worked by compressed air and an air conditioning system: described by Joshua Field as "He has a good stove for heating the rooms with hot air which enters the rooms and staircases at convenient places." 1892 At the celebration of the centenary of gas lighting in 1892, a bust of Murdoch was unveiled by Lord Kelvin in the Wallace Monument, Stirling, and there is also a bust of him by Sir Francis Legatt Chantrey at St. Mary's Church, Handsworth, where he was buried. His life and works are commemorated by the Moonstones; a statue of him, Matthew Boulton and James Watt , by William Bloye; and Murdock Road, all in Birmingham. There is also a Murdoch House in Rotherhithe, London. This page was last edited on 12 February 2019, at 12:30.